Last week I published a post dealing with the possible integration of armed forces into the world of digital diplomacy. I was first interested in this issue after reading that the US Central Intelligence Agency (CIA) had joined twitter. The CIA’s first tweet was a “tweet heard round the world” as it attracted much media attention. The CIA is of course not the first member of a nation’s security establishment to joint twitter. 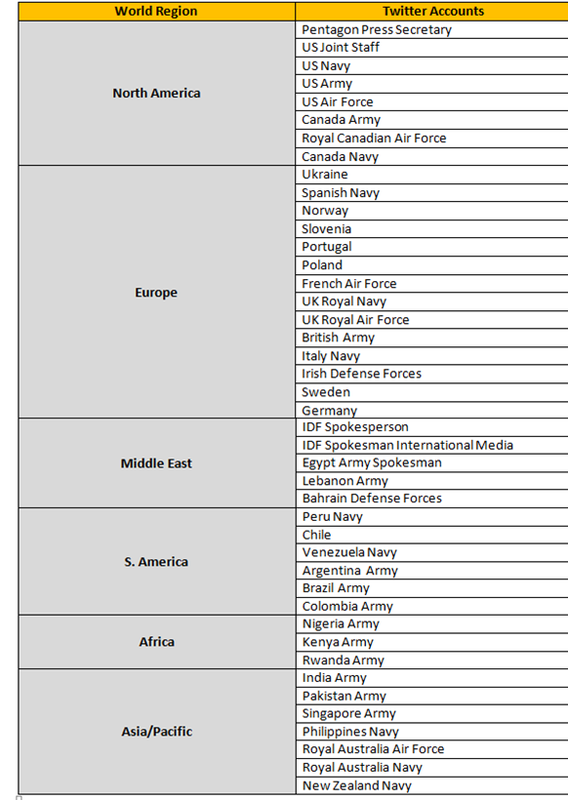 Dozens of militaries are now active on twitter as made evident by the following list published by @Twiplomacy. It stands to reason that militaries may play a role in a nation’s digital diplomacy apparatus. This is due to the fact that during times of conflict, nations use digital diplomacy channels such as twitter and Facebook in order to convey a specific narrative to their followers be it foreign populations, journalists or other diplomatic institutions. For instance, during the Crimean crisis both Russia and the US offered their own interpretation to the events taking place in Ukraine. According to the Russian MFA’s twitter channel, a coup d’etat had taken place in Kiev endangering the lives of Russian minorities in Crimea. According to the US, Russia violated international law when forcing the population of Crimea to participate in a referendum under the threat of force. And it was during this crisis that the US State Department re-tweeted posts by the Pentagon’s Press Secretary, thus enabling the US Armed Forces to partake in the narrative building process. Another military that seems to have been integrated into the national digital diplomacy effort is Israel’s Army (IDF) whose tweets and posts published during the recent confrontation in Gaza were frequently quoted by the international press. Do Foreign Affairs Journalists Follow Armies? In order to evaluate the extent to which armies are now part of the world of digital diplomacy, I decided to examine if they are followed by foreign affairs journalists. It would not be surprising to learn that armed forces, and their spokespersons, are followed by defense and security journalists. Yet if they are now followed by foreign affairs journalists, foreign correspondents and diplomacy correspondents, than perhaps they truly have joined the online diplomatic corps. 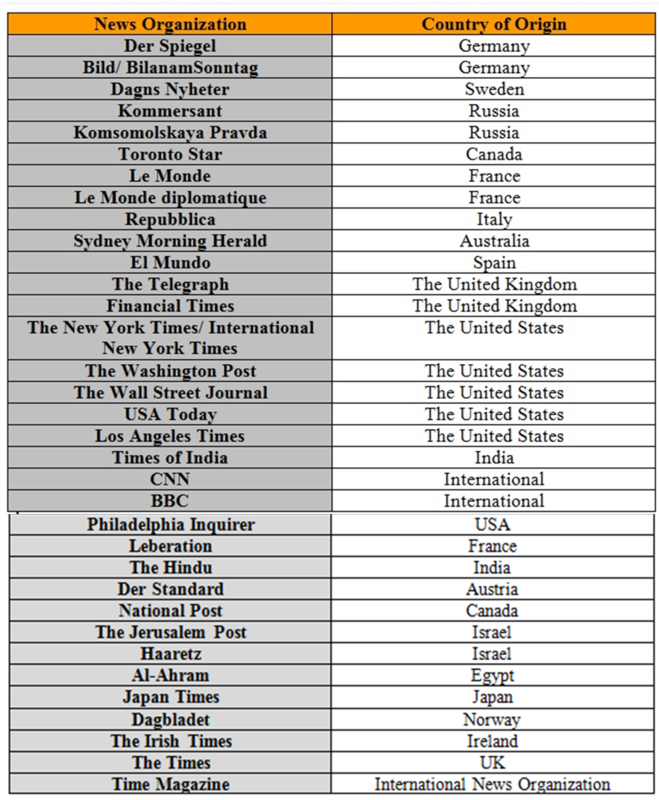 Assessing the degree to which armies are followed by foreign affairs journalists was made possible by compiling a sample of 163 editors in chief, senior editors, foreign news editors and foreign correspondents from leading news organizations around the world. The sample may be viewed in the table below. The results of my analysis can be seen in the graph below. 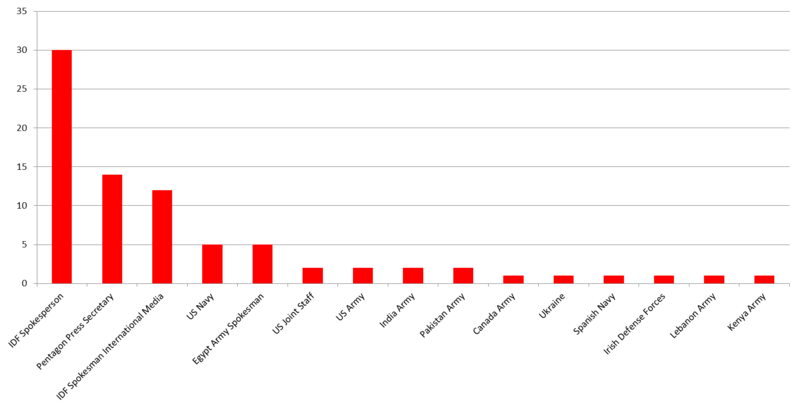 As can be seen, 15 of the 43 militaries evaluated are followed by one or more foreign affairs journalists. This is a rather surprising figure indicating that one third of the armies evaluated are able to attract foreign affairs journalists and editors. However, only the IDF, US Pentagon and Egypt Army Spokesperson seem to attract a substantial amount of foreign affairs journalists. 76% of armies attract one or no journalists at all. The results of this analysis can be seen below. 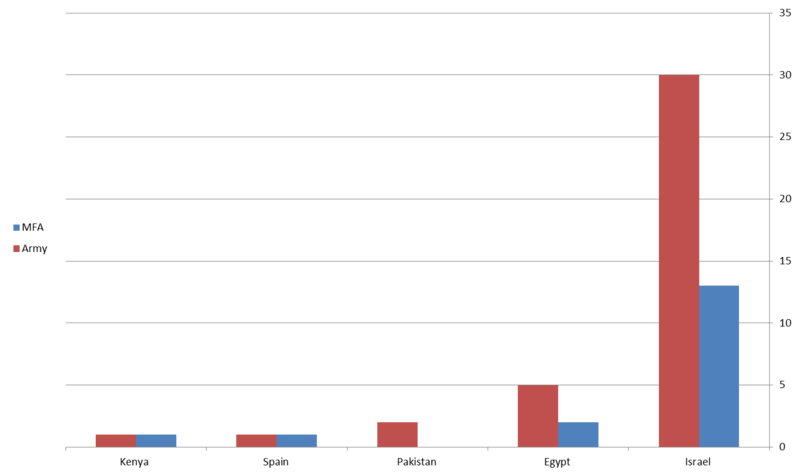 This graph clearly demonstrates that MODs seem to attract less foreign affairs journalists than militaries. Only 9 of the 34 MODs attract any journalist and only the US, Norway and Israel’s Minister of Defense attracts a substantial amount of foreign affairs journalists. The most surprising result of this analysis came when I compared the number of journalists following MFAs to that following armies. 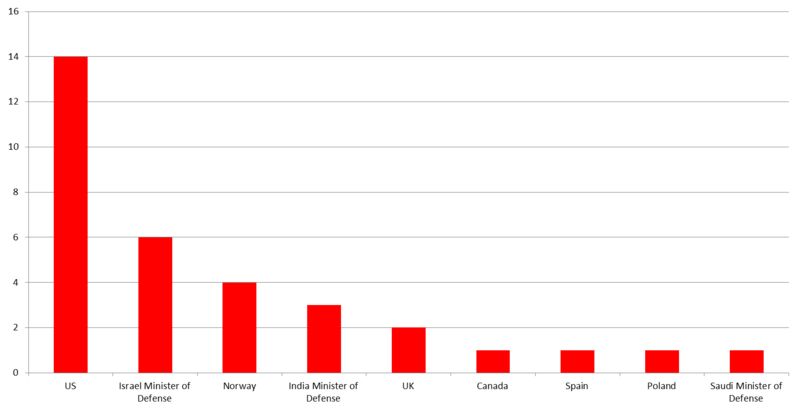 As can be seen in the graph below, in five countries the number of journalists following armies was equal or greater than the number of journalists following MFAs. This gap was most evident in Israel and Egypt’s case case. The fact that the Israeli IDF and Egyptian army spokesperson attract more journalists than these countries’ MFAs could prove detrimental to digital diplomacy efforts. When one a country speaks in many voices, its messages could soon become disorganized and counterproductive. This is also true in the US State Department’s case. While the Pentagon Press Secretary does not attract as many journalists as the State Department he is very popular among foreign affairs journalists and could therefore counteract messages circulated by the State Department. The question raised by these results is to what extend are armies and MFAs coordinated? More importantly, how do they practice digital diplomacy in times of crisis? Do armies and MFAs each tell a different story or do they coordinate messages and offer journalists one coherent narrative answering the question- why we fight? Times of crisis are important case studies as such times see an increase in MFA and army digital diplomacy activity as well as increased media attention. It appears that with the exception of the US Israel and Egypt, armies have yet to attract an important audience base of digital diplomacy- foreign affairs journalists. Thus, their ability to become part of a national narrative, and partake in the world of digital diplomacy, may be limited. However, despite the small number of foreign affairs journalists following armies, at time armies seem to attract more media attention than MFAs. The fact that Israel and the US are the exception to the rule could be related to the fact that both nations are currently engulfed in armed conflicts and that both nations attract media attnetion. Interestingly, Russia’s army is not on twitter and could therefore not be part of this analysis. The results of the analysis presented in this post do not offer a definitive answer to the question- have armies become part of a nation’s digital diplomacy apparatus? Far from it. The sample of journalists used in my analysis was rater limited. Likewise, while all the armies analyzed operate twitter accounts, not all are active on a daily basis. Yet this post may be seen as a stepping stone towards further research and as a humble attempt to examine the role armed forces now play in Twiplomacy. Posted in Uncategorized and tagged armed forces, armies, Digital Diplomacy, IDF, militaries, Pentagon, twiplomacy. Bookmark the permalink.